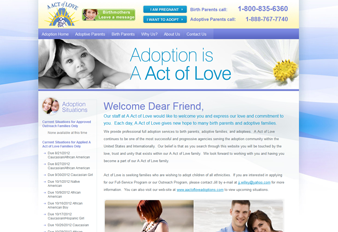 The organization A Act of Love is a Utah service that works to help both families who desire a child and birthparents who wish to place their child up for adoption. A Act of Love works diligently to provide a full set of services to both potential adoptive parents and birthparents alike. The organization knows that adoption is a gift, but the process can be one fraught with ups and downs, A Act of Love is there to support both parties equally. Adaptivity Pro is the brainchild of entrepreneur Eric Morgan whom is the current CEO. Since 2004, Morgan has been leading this wed design and Internet marketing firm down a successful path. While Utah is the base for Adaptivity Pro the company has also expanded beyond regional clients and has worked with both national and international clientele, all of which have benefitted from professionalism, knowledge and reasonable rates offered by Adaptivity Pro.